Cleo Faulkner, a member of the Fire Depot Customer Services team has been voted Values Champion for Q4 2018 by colleagues across the business. She was recognised as the person who most consistently demonstrated the company’s values during that period. Cleo received her award during the company's ‘One Team, One Vision’ 2019 kick off session which took place on 2 January. 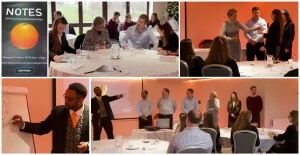 The team spent the day with motivational speaker Steve Beckles Ebusua – otherwise known as ‘the man with the orange tie’ - practicing effective communication techniques aimed at promoting understanding and closer working with both customers and colleagues. Apart from Steve’s tie, there were many other orange items around during the day, including his shoes, socks and bag – and even the lighting in the room had an orange hue!